Here at Crowley, we are making a $550 million investment that will transform our cargo shipping and logistics services between the U.S. Mainland and Puerto Rico, creating a new level of speed, efficiency, reliability and eco-friendly operations. Our investment is highlighted by the construction of two new combination container/Roll-On Roll-Off (ConRo) ships powered by liquefied natural gas (LNG). As well as, new terminal facilities and gantry cranes in San Juan, Puerto Rico, and terminal improvements in Jacksonville, Fla., including LNG bunkering infrastructure, will be game-changers in every way. Our commitment to customers and the people of Puerto Rico could not be stronger. This Commitment Class site serves to keep you up-to-date on these exciting developments. View photos, specifications and renderings of our new LNG-powered ConRo ships, which will create new levels of speed, efficiency and reliability in cargo transportation between the U.S. mainland and Puerto Rico. See how construction is progressing on our 85-acre port terminal in San Juan, Puerto Rico. More than $130 million is being invested on a new pier, container cranes, container storage areas, terminal operating system & more. Our new ConRo ships will be powered by eco-friendly LNG. Learn more about the benefits of LNG as a fuel source, and see how we are building a bunker fueling facility with Eagle LNG Partners at JAXPORT. Stay abreast of the latest developments with the Commitment Class Project right here. "The launch of El Coquí is a strong indication of our commitment to the success of our customer Crowley." “This is a great accomplishment for both teams; we very much appreciate this opportunity to build such a magnificent ship for such a great company." "A new stage in the economic development of Puerto Rico." 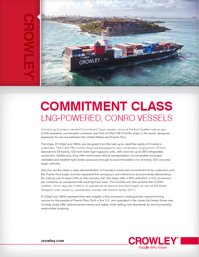 "We recognize Crowley’s leadership as an early adopter of this fuel." “We expect LNG demand for ship fuel to increase to 30 million tons a year (MTPA) by 2030."